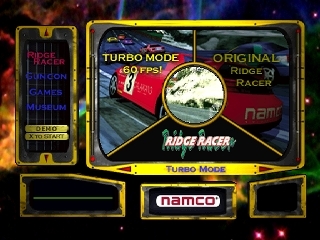 This disc was included as a bonus pack-in game with Ridge Racer Type 4, and features the complete Ridge Racer game, plus a scaled down version of the game running at a smooth 60 frames per second, known as “Turbo Mode”. You might not think the difference would be noticeable, considering that the original game ran without any slowdown, but the difference is quite obvious. Unfortunately, to make up for the extra processing power needed to generate that frame rate, the game only runs in either “Time-Trial” or “Time Attack modes, meaning that it is not possible to race against more than one other car. This isn’t that big of a deal, but the track feels empty without the other drivers. The disc also contains videos, slide shows, and playable demos for other Namco games, such as Tekken 3, Time Crisis, and Namco Museum. Its pretty impressive that a game company would provide a complete game from the same generation as a pack-in with a subsequent title from the same series, especially when that game was good enough to warrant a separate purchase just a few years earlier. As this disc features the original game in its entirety as well as the bonus material, there is no real reason to own a copy of Ridge Racer if you can grab Ridge Racer Type 4 instead. Buy Ridge Racer Type 4 on GameGavel or Amazon. Tagged 1999, Arcade, Bonus Disc, Namco, Playstation, PSX, Racing, Review, Ridge Racer, Sony, Turbo Mode. Bookmark the permalink.